Make Everyday Earth Day in the Garden! 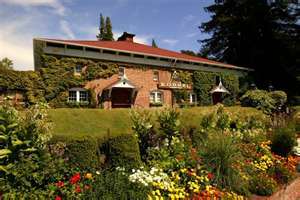 Korbel Champagne Cellars’ near Guerneville in Sonoma has opened its spectacular gardens for visitors to marvel at the extraordinarily beautiful plantings – including 250 varieties of roses – scattered among the towering redwoods that surround the historic circa 1882 Korbel House. What isn’t obvious to many visitors is Korbel Champagne Cellar‘s commitment to sustainability– in the vineyards and in the gardens. As the world celebrates Earth Day on April 22nd this year, Korbel Garden and Korbel Champagne Cellars will demonstrate that many of the stereotypes associated with sustainability no longer apply. Not anymore – Korbel Garden’s energy and water-efficient drip irrigation system, integrated pest management (which uses beneficial bugs and nematodes) and rich, natural compost (made from vineyard waste) produce flowers and foliage more beautiful – because the plants are healthier – than those in gardens dependent on pesticides and chemical fertilizers. Plus, the inclusion of drought-resistant native California plants adds to the Garden’s rich palette and helps reduce water consumption. The expansive size of the Korbel Garden refutes another sustainable stereotype – that sustainability by necessity must be small. Scale no longer limits sustainability. Korbel sustainably farms 2,000 acres of vineyards, using cover crops, integrated pest management, drip irrigation and state-of-the art monitoring systems. Within Korbel Champagne Cellars, energy-efficient refrigeration and lighting, insulated wine storage tanks and high-speed bottling equipment cut electricity use, reduced-weight bottles cut fabrication and delivery costs, and bottles and boxes made with recycled content preserve natural resources. From opening day on April 15 through mid-October, free guided tours of the Korbel Garden are offered Tuesday through Sunday at 1:00 p.m. and 3:00 p.m.
Those who come to Korbel Champagne Cellars to see the Korbel Garden often begin or end their tour with a refreshing sample of Korbel California champagne or lunch at the Korbel Gourmet Delicatessen. Korbel California Brut made with organically grown grapes is among the California champagnes available, and it refutes a last sustainability stereotype; that sustainable products are “different.” Korbel California Brut made with organically grown grapes offers the same lively sparkle and fresh, delicious character as Korbel’s other California champagnes. It isn’t just a delightful organically grown wine – it is a delightful wine, period. Established in 1882, Korbel Champagne Cellars is the oldest continuously operating champagne house in America. It produces methode champenoise champagne. 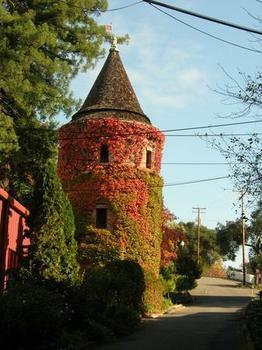 Among Sonoma County‘s top visitor destinations, Korbel is located on River Road near Guerneville, California, 14 miles west of Highway 101. Additional information regarding Korbel Champagne Cellars and Korbel Garden are available by telephone at 707/824-7000 and via the internet at www.korbel.com. Tell them you heard about it in the Word Garden. Cheers!